"Automated decisions systems are probably already being used in your industry, and they will undoubtedly grow in importance. If your business needs to make quick, accurate decisions on an industrialized scale, you need to read this book." Thomas H. Davenport, Professor, Babson College, Author of Competing on Analytics The computer-based systems most organizations rely on to support their businesses are not very smart. Many of the business decisions these companies make tend to be hidden in systems that make poor decisions, or don't make them at all. Further, most systems struggle to keep up with the pace of change. The answer is not to implement newer, "intelligent" systems. The fact is that much of today's existing technology has the potential to be "smart enough" to make a big difference to an organization's business. This book tells you how. Although the business context and underlying principles are explained in a nontechnical manner, the book also contains how-to guidance for more technical readers. 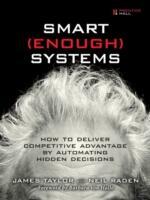 The book's companion site, www.smartenoughsystems.com, has additional information and references for practitioners as well as news and updates. Additional Praise for Smart (Enough) Systems "James Taylor and Neil Raden are on to something important in this book-the tremendous value of improving the large number of routine decisions that are made in organizations every day." Dr. Hugh J. Watson, Chair of Business Administration, University of Georgia "This is a very important book. It lays out the agenda for business technology in the new century-nothing less than how to reorganize every aspect of how a company treats its customers." David Raab, President, ClientXClient "This book is an important contribution to business productivity because it covers the opportunity from both the business executive's and technologist's perspective. This should be on every operational executive's and every CIO's list of essential reading." John Parkinson, Former CTO, Capgemini, North American Region "This book shows how to use proven technology to make business processes smarter. It clearly makes the case that organizations need to optimize their operational decisions. It is a must-have reference for process professionals throughout your organization." Jim Sinur, Chief Strategy Officer, Global 360, Inc.